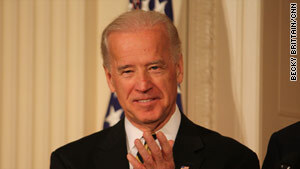 Vice President Joe Biden spoke to ABC's "This Week" in an interview that was broadcast Sunday. (CNN) -- As few as "a couple of thousand" U.S. troops may leave Afghanistan in the first phase of withdrawing forces from there beginning a year from now, Vice President Joe Biden said in an interview broadcast Sunday. "It could be as few as a couple of thousand troops; it could be more," Biden told ABC's "This Week." Asked about a book that quotes him as saying the troop withdrawal would start with "a whole lot of people" leaving Afghanistan, Biden confirmed the comment but said he was responding to an assertion that there might be no withdrawal at all at that time. "I did say it," Biden acknowledged, calling the July 2011 withdrawal date "the beginning of a transition" based on the ability of Afghanistan forces to provide security around the country. Noting there will be more than 100,000 U.S. troops there a year from now, Biden said the situation would be assessed across Afghanistan and troop withdrawals would begin where circumstances allow. At the same time, Biden called the process of training Afghanistan security forces to take over for U.S. forces as "painfully slow and difficult." However, "there will be a transition," he insisted.